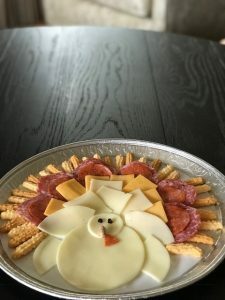 Looking for an easy and fun turkey platter that does not require any cooking and a fun activity to include the kids? Make a Chedz turkey platter that is loaded with high protein and low carbs. There is no measuring involved; use as many ingredients as you like for your platter depending on number of guests. Various cold cuts To expand on feathers. We used pepperoni and salami but you can use turkey, ham, etc. 1 4 OZ Chedz (Any Flavor) We used a variety of flavors. If Gluten Free, use those flavors. 1 Piece Almond For the beak or use other ingredients as desired. Prepare a platter with parchment paper or other. Pictured is a 12" diameter platter. Set a round provolone slice of cheese on platter as base of turkey body. Cut a slice of provolone cheese in quarters and use as wings by laying them around the base of the body (see pic). Using a small and round cookie cutter or a TBS, make the head and place it on top of the body. Use 1 piece of raisin and cut little eyes and place on head. Use an almond or alternative ingredient (i.e. cashew) and place it to resemble a beak. Cut a piece of pepperoni (or alternative ingredient such as a tiny piece of bell pepper or other) and place it close to the beak to resemble the flap. 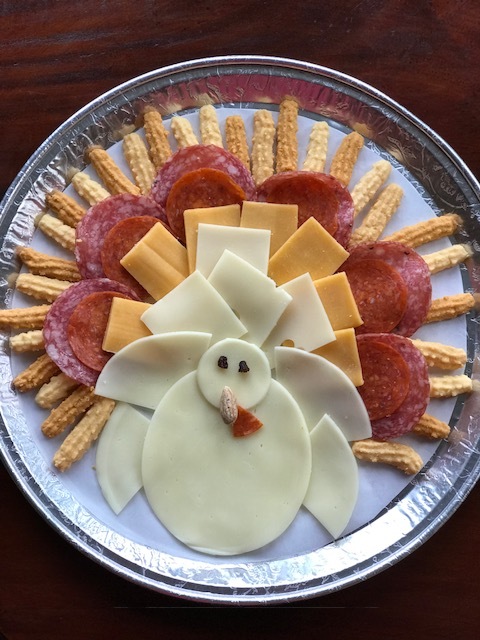 Spread various cheese squares to resemble feathers. Depending on the number of guests, stack the squares if needed. Layer salami and pepperoni or cold cuts of choice. Similar to cheese, stack the cold cuts depending on number of guests. Add Chedz sticks and tuck them underneath the cold cuts. Chedz sticks are great wrapped with cheese and cold cuts such as salami and pepperoni. Hope your guests will enjoy this festive platter!